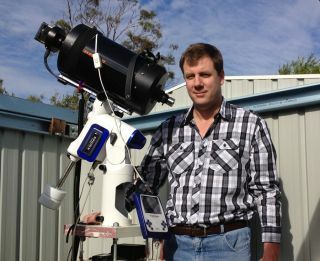 Amateur comet hunter Terry Lovejoy of Thornlands, Australia stands with the telescope and camera he used to discover the sungrazing comet C/2011 W3 (Lovejoy). The sungrazing comet C/2011 W3 (Lovejoy), set to skim the surface of the sun late Thursday (Dec. 15), was discovered two weeks ago by amateur observer Terry Lovejoy. SPACE.com: Will you be watching your comet's pass by the sun today? Lovejoy: Unfortunately we have clouds here so I think I'll be watching it on the internet. It's pretty dangerous [to observe something so close to the sun]. My plans will be just looking at satellite imagery. SPACE.com: Do you think there's any chance comet Lovejoy will survive its sun encounter? SPACE.com: What do you make of all the excitement surrounding this comet's impending encounter with the sun? Lovejoy: It's been tremendous. Apparently it's all over Facebook, and I don't use Facebook. But there's a lot of interest. I think a lot of people like the name — the Lovejoy name seems to strike a chord with people. SPACE.com: How did you discover this comet? Lovejoy: I used an 8-inch reflector [telescope] in a special configuration that allows me to image a large area of sky with a monochrome CCD camera, which is commonly used by a lot of astronomers to image stars. It's a camera that's a lot more sensitive than a normal digital camera that you might use. The telescope is automated so it takes a series of images of different parts of the sky, which then get processed. The following night I looked through the images for unusual objects. This was the 27th of November. It was quite easily visible — just a little smudgy ball. I take photographs of the same part of the sky about 10 minutes apart, so I'll take three images 10 minutes apart. Anything like a comet or an asteroid will be clearly visible moving between the images. You can't see them moving in real time, you need a time gap to see the movement. By looking at the images quickly I can see an object moving, and that's how I discovered this one. SPACE.com: How long have you been a comet hunter? Lovejoy: I've been doing this for about 7 years. This is my third discovery so far. Before that I actually found 10 comets using the SOHO images [from NASA's Solar and Heliospheric Observatory]. Some were sungrazing, some were other types but very close to the sun. SPACE.com: Where did you learn to hunt comets? Lovejoy: I'm a self-trained amateur. It's just a hobby for me. SPACE.com: How did you find out that this recent comet was a sungrazer? Lovejoy: A friend of mine who does confirmations of comets thought it was in the right path for a sungrazing comet. It was probably around the initial announcement, which was on the 2nd of December, that there were enough observations made of it to prove it was a sungrazing comet. SPACE.com: How did you feel when you found out? Lovejoy: A little bit shocked, because these comets are a bit of a holy grail of comet discoveries. Even though they appear quite frequently in SOHO imagery and in STEREO imagery [from NASA's Solar TErrestrial RElations Observatory], the majority are very small. Most aren't bright enough to be seen from the ground. So it is quite rare. These comets have quite a stake in history. Probably the most spectacular comets in history were of the same sungrazing group. The last really bright sungrazing comet was in 1965, an incident which my father saw and witnessed. SPACE.com: Was your father a comet hunter, too? Lovejoy: No, he was an electronics technician, and he was actually on call at the time, basically looking after a radio transmitter station in central New South Wales. He saw the comet in the sky because it was still dark and he remembered seeing the newspaper the following day announcing there was a bright comet. He would often recount the story to me. He remembered and described it, the shape of the tail, how it looked like a giant feather sitting in the morning sky. SPACE.com: Did that influence your interest in comets? Lovejoy: I think what sparked my interest in comets was that my grandmother saw Halley's comet in 1910, and it was apparently quite spectacular at that particular return. We actually passed through the tail of the comet in that particular year. SPACE.com: What sort of scientific questions are people looking into regarding these comets? Lovejoy: One of the big questions is the origin of the Kreutz sungrazing comets. I'm hoping the discovery of this one will actually help in that study; I'm sure it will. SPACE.com: Do you plan to keep searching for new comets after this? Lovejoy: I think there might be brighter ones on the way, so I'll continue searching for comets. I really feel that in the next 10, 20 years we might see another brighter one. As long as I still enjoy doing what I'm doing, I'll continue doing it.